Imagine a venom so toxic that one drop can kill 100 grown men. That’s the venom of the fierce snake, the world’s most poisonous snake. Fortunately, fierce snakes live in remote areas of Australia where few people live. Despite their name, fierce snakes aren’t aggressive. They just want to be left alone. 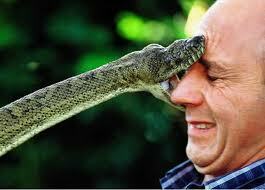 There has never been a report of a human being killed by a fierce snake. All about the fierce snake, the world’s most poisonous snake. Fortunately, fierce snakes live in remote areas of Australia where few people live. Fierce snakes can be brownish black to light yellow. They sometimes turn yellow in the summer and black in the winter. Fierce snakes eat rats, and lots of them. In this part of the world, there are so many rats that they become a problem. They can carry disease or eat human food. 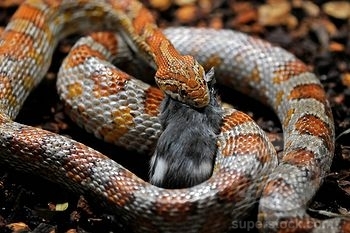 Fierce snakes keep rats under control by eating them. Fierce snakes eat rats, and lots of them. Fierce snakes live in hot deserts. They hide in cracks in the soil to stay cool. Female fierce snakes lay eggs in old burrows or cracks in the earth. They may lay 10 to 20 eggs at a time. 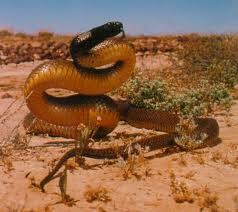 Fierce snakes are also called inland taipan snakes. Fierce snakes are much too dangerous. Their venom can kill a grown man in 45 minutes. A documentary video about the nature of the fierce snake. Question: Why is the fierce snake so poisonous? Answer: The fierce snake lives in a very harsh land. It’s hard to find food, so when the snake does find prey, he needs to make sure he can kill it with one bite. Question: Can fierce snakes be kept as pets? Answer: Absolutely not. Fierce snakes are much too dangerous. Their venom can kill a grown man in 45 minutes. Enjoyed the Easy Science for Kids Website all about the Fierce Snake info? Take the FREE & fun all about the Fierce Snake quiz and download FREE Fierce Snake worksheet for kids. For lengthy info click here. Declan, Tobin. " Fierce Snake Facts for Kids ." Easy Science for Kids, Apr 2019. Web. 23 Apr 2019. < https://easyscienceforkids.com/all-about-the-fierce-snake/ >.